While I’ve never been one for New Years Resolutions, much preferring to set goals throughout the year, this time round was a little different. For 2019, I wanted to do things that challenged my comfort zone…and don’t get me wrong – I love a good bed day, watching Netflix and drinking tea – however, having a project that helped to spark a new sense of passion was something that I craved. After a chance encounter with one of the team from Powder, it seemed as if the perfect opportunity was at my doorstep – and I was more than ready to take it. I’ve always had a passion for fashion (not to quote those early 2000’s dolls); being enchanted by colours and designs that can help to express who you are – or who you want to be – spoke to me this year more now than ever. While dressing yourself can sometimes be monotonous, style and flare can often be as seen as frivolous and unimportant. The great thing about Powder, is that in a way, you find the balance between the two – sparking joy and excitement into your daily outfits by starting to add those little individual and unique pieces that can really help bring everything together. I started blogging and styling outfits with my friend Rebecca; I was inspired by my mum who started her fashion and lifestyle Instagram and has been really successful. I love taking photos of her and styling her outfits so I thought I would give it a go myself! That’s how my blog Rebelle came about. When the opportunity arose to style three looks for Powder I jumped at the chance. I was more than ready to take on the next project with Powder, becoming a Brand Ambassador, merging all of my previous experience into the one role. It tied in perfectly with my 2019 goal of doing things out my comfort zone. I don’t know about you, but I think that my heart is in spring while my head is in winter. Luckily, Powder have just released their beautiful new Spring/Summer 2019 Collection – adding some gorgeous new Knee-High Socks (perfect for this time of year) as well as a whole range of Sunglasses – all of which I’m in love with! For my first outfit, I thought it would be a nice touch to combine some of my own Powder items from previous seasons with some newer products. The Charlotte Hat is always a Powder classic; you can never go wrong with it, the chunky knitted design and the cute furry pom-pom are a staple to the many colours that they come in. I have the Camel shade, which went perfectly with the Zara Wrap (which I actually borrowed from my mum) that comes in the Camel and Berry mix! I decided to keep what I was wearing underneath super simple and easy; a grey turtleneck and a pair of cropped denim jeans. I wanted to make sure that it was an outfit that you could throw on in the morning, yet still dress it up and make it look more interesting thanks to the accessories used! As I’m based in Scotland, you always need to have a cosy pair of gloves in your arsenal. The Lizzy Wool Gloves are made with 80% wool, perfect for keeping out the cold chill in the air – even on the sunniest of days! If you already own a pair of Powder Socks, you will already know all the selling points; they’re super soft…making your feet feel amazing, all helped by the bamboo in the fibers, as well as their cute and cool designs – ranging from Cocktail Drinking Pugs, Banana Prints, Fabulous Flamingos, and bright floral designs. 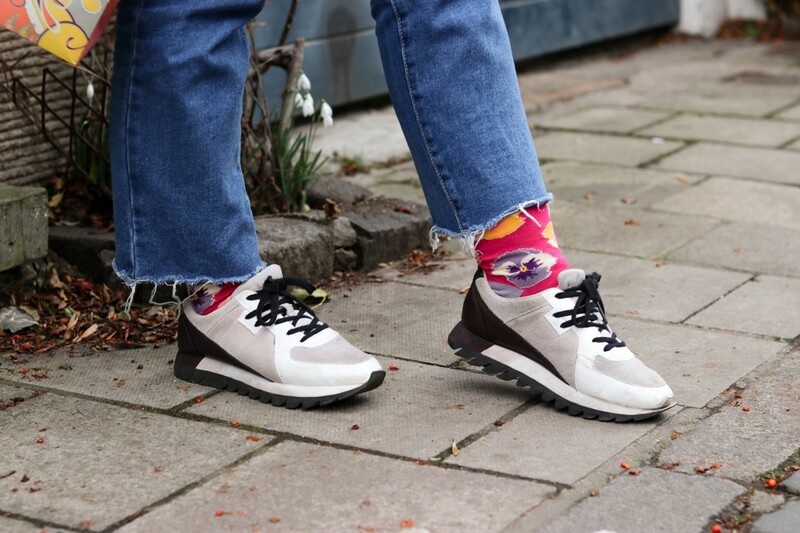 Whoever said florals for spring weren’t ground breaking, didn’t own a pair of the Powder Pansy Knee-High Socks! 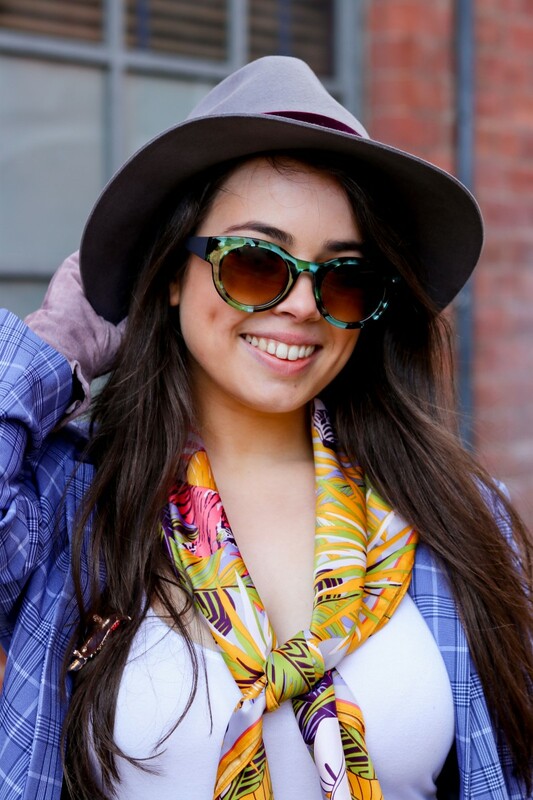 To finish off the whole outfit, I popped on a pair of the Megan Sunglasses in Stone and Candy. I love the two-toned aspect of their design, making you look twice – again, one of the great things about Powder is their unique approach to design, taking something ordinary and mixing it up to make it different. Like I say, this is the perfect everyday look - by keeping your outfit nice and simple, you can add on all of those accessories that you love in order to make it more interesting and a little different to the usual. 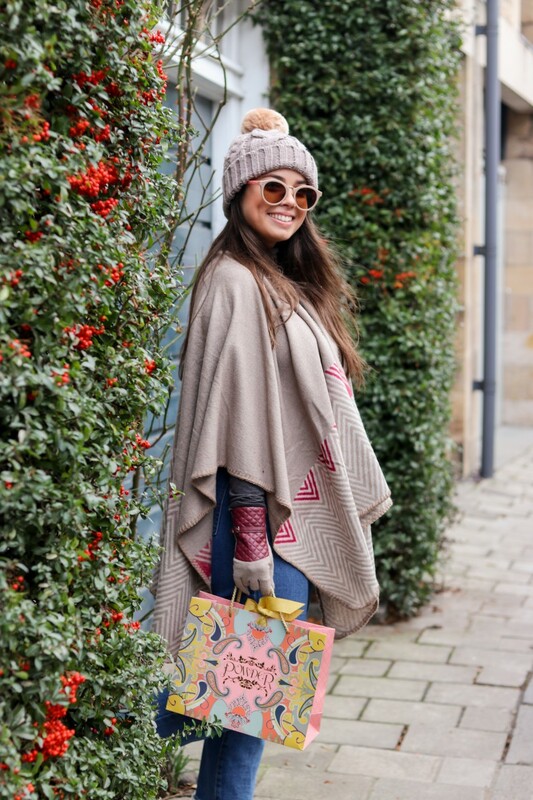 I adore the colour palette of the Camel and Berry Shades, each of the accessories complimenting the other and bringing the whole outfit together. 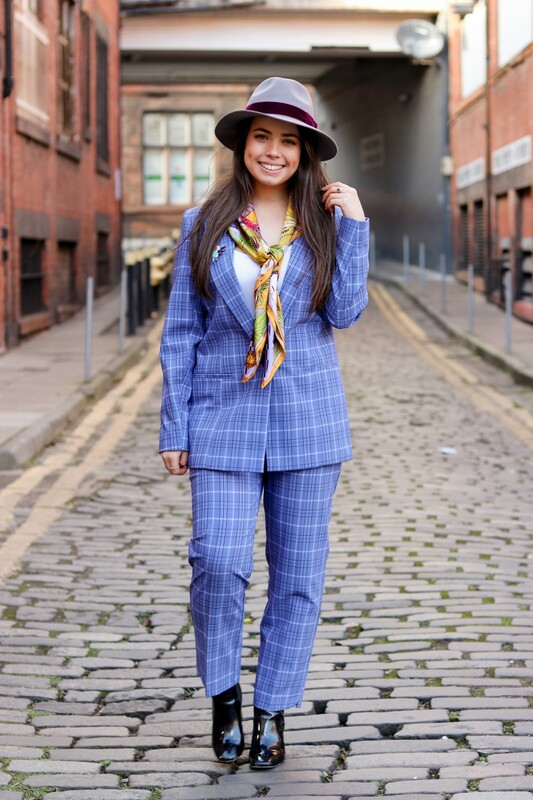 The next look has to be my favourite, I was really excited when I bought this Miss Selfridge Blazer and Tapered Trousers in a blue check, however, I was at a loss of how to wear it and accentuate it to its full potential! There is no reason that work wear has to be boring and it’s safe to say that I would be just as happy wearing this over the weekend as I would be at the 9-to-5! 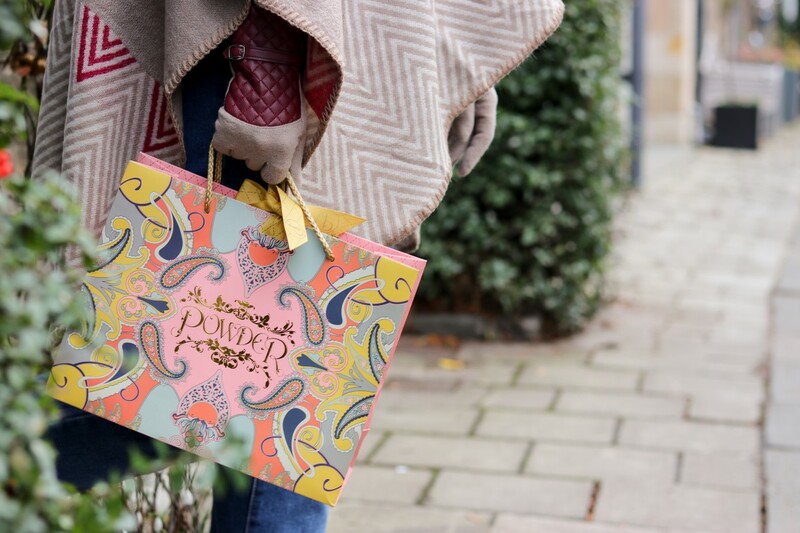 I knew that Powder often had Satin Scarves with their classic Paisley Print; however, this is the first time that I noticed that there were designs that were slightly out of the ordinary! Leaf prints with wild animals evoking a sense of exotic adventure beyond the everyday – a great little reminder for those days that are anything but! As soon as I spotted the Elephant Parade Satin Square, the rich mustard yellow – almost golden - tones contrasting with the pale lilac and dashes of pink, purple and green, I just knew that I had to add it to my collection! It was the combination of the blue checked suit matched with the Elephant Parade Satin Square that really made the outfit come to life, from there it was easy to start finding colours that matched and complimented each other. The Kelly Sunglasses are described as being Turquoise, that being said, I don’t know if that truly gives you the best idea of what they look like. The colours of green, black, teal and blue, all collide together to almost look like an ancient crystal that’s been created over years and years. Honestly, they’re quite magical – which is why they’re my favourite pair! Powder also have a beautiful collection of jewellery, their brooches are some of the shiny and sparkliest I’ve ever seen! 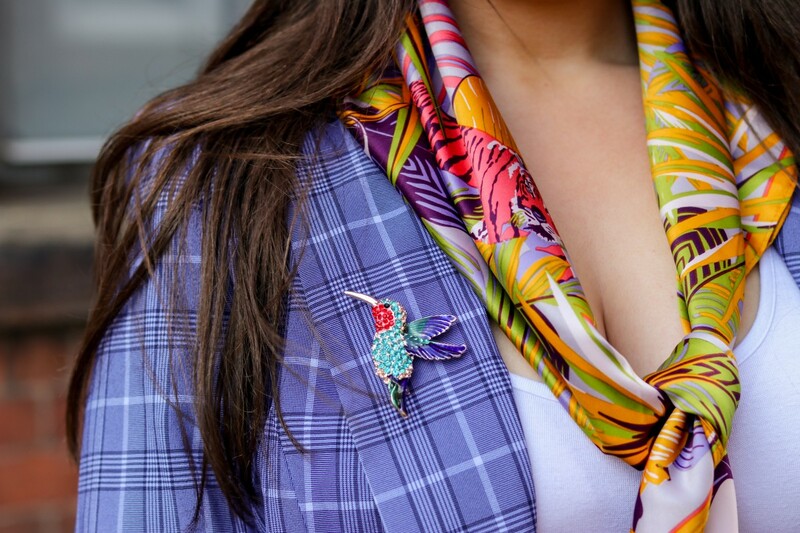 I thought that the Hummingbird Brooch would go perfectly with the Elephant Parade Satin Square, equally exotic – and with all the colours mixing and matching together – perfect for adding a little extra detail to your day! There may be a chance that you recently read my mums blog post – I’ll link it here – she had actually bought me one of the Wendy Hats in Charcoal for my Christmas…I loved it so much that I decided to buy the Wendy Hat but in Slate. I thought that the deep Damson of the textured ribbon would help enhance the slightly darker check that runs through the suit – and I don’t think I was wrong! 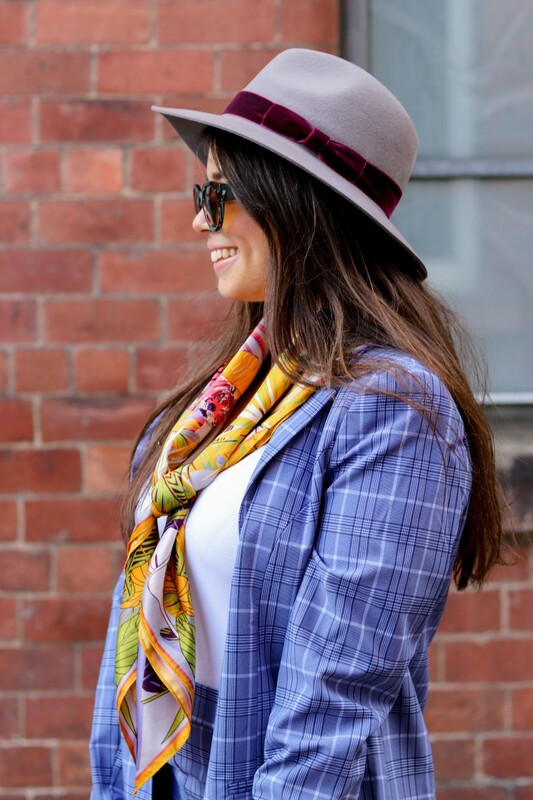 The adjustable brim of the Wendy Hat means that no matter if you have a big or small head – you’ll be able to fit it in order to style it your way! What do you think of the outfit overall? Is it something that you’d wear yourself? I think that perhaps, there may be a few people that would be overwhelmed by the colour of the suit rather than the accessories themselves. If that were the case, this collection would go as equally well with a dark navy or deep green shade of suit. That being said, in my opinion, there is nothing more freeing than being able to wear something that you absolutely love and makes you look and feel amazing! I’d love to know your thoughts! They say that good things come in threes – my third and final outfit is no exception! It wasn’t until I was putting it together, that I started to notice a reoccurring theme – whether it was the colour blocking of a print, the different tassels on a bag, or the design of hair clips, all of them came in amounts of three. Again, for this casual weekend look, I decided to smarten it up just a little with black skinny jeans and a pair of patent heeled chelsea boots – making the colours of the accessories really pop! I am a huge fan of the classic Margot Sunglasses and found it hard to pick between the dark tortoiseshell or the lighter pink pair, however, as my outfit focused on bold colour blocking, I thought that the pink pair would have clashed with the cooler tones. The Tess Poncho that I had chosen comes in in Mustard, Teal and Ice – there are two others that come in a Slate, Stone and Berry mix, as well as a Stone, Camel and Tangerine mix. 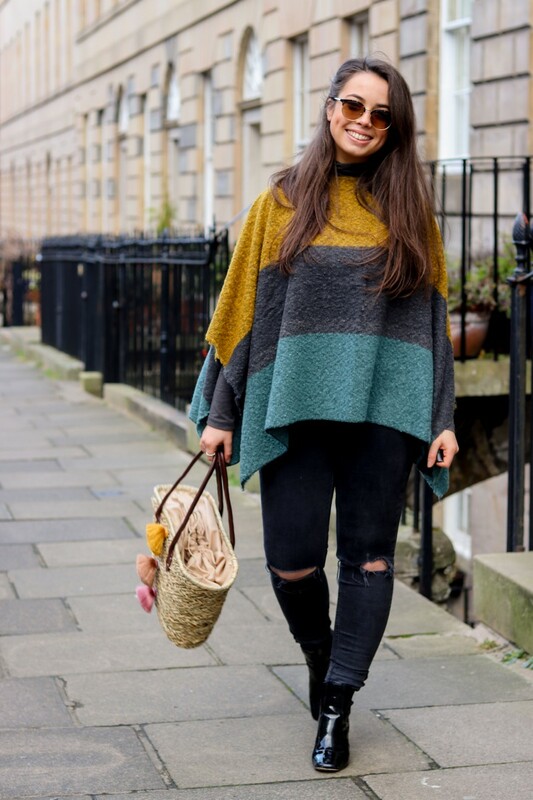 I love the strong colour blocking of the Tess Poncho, it’s not normally an item that I would think to buy – however, after wearing it on the shoot I’m sold! 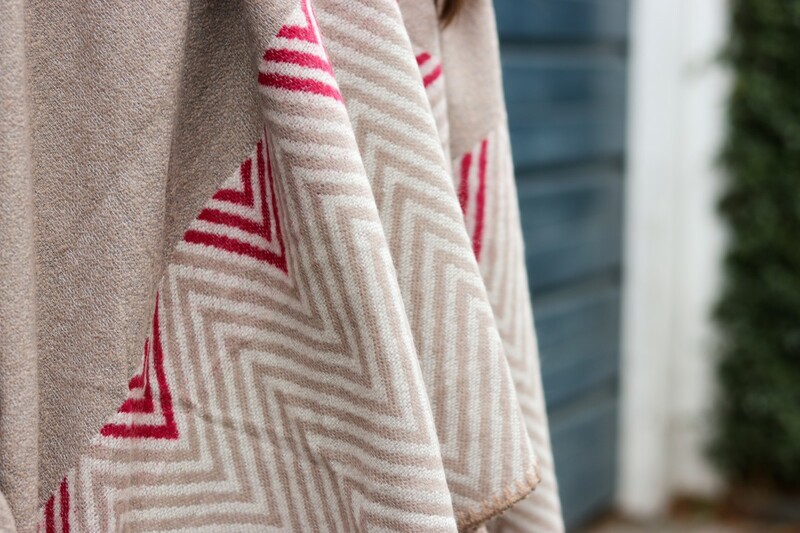 It is so easy to wear, plus its lovely to touch – very soft and cosy, ideal for thawing off the last of the winter days! The clue may be in the name, but I couldn’t not go for the Bella Bag! 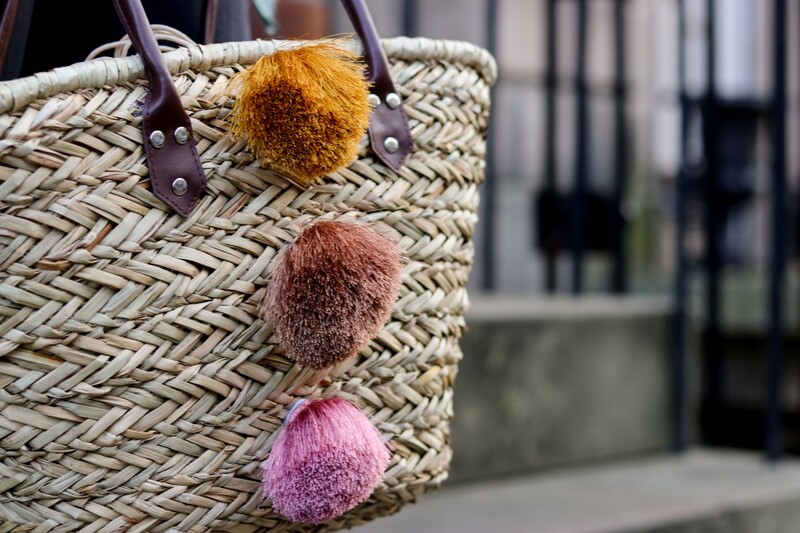 I loved the fact that it is made with Seagrass, with the three colourful tassels making for both a bold and stylish choice this summer! I can’t wait to take it on holiday to either the beach or the pool – but for now, I think it makes a rather elegant spring look on the streets of Edinburgh! The string tie and additional fabric also comes in handy, keeping everything inside just a little bit safer! 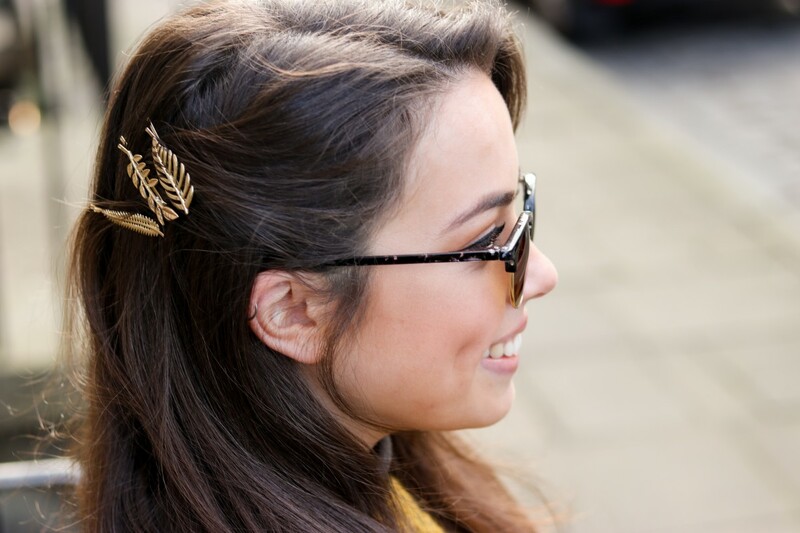 The final detail of my look are the Golden Leaves Hair Slides, I love how they bring out the golden colour of my Margot Sunglasses, as well as keeping in with the unexpected theme of thirds! They’re a lovely little extra for keeping the wind out of your hair and can be just as lovely on a night out as they can be during the day! Already I’ve had so many compliments on them! It’s been such a joy to put these three looks together for the team at Powder, it always helps when you’re instantly inspired by just about everything on their site! Which of the looks have been your favourite? What kind of styles would you like to see next? Perhaps a post focused purely on dressing up your work wardrobe? Or maybe something focused on the sunnier weather to come? I would love to hear your thoughts and start planning the next project! Follow, comment, or message the Powder team on Instagram and lets start to get creative! We’re delighted to bring Annabelle Brodie into the Powder family as one of our Brand Ambassadors! 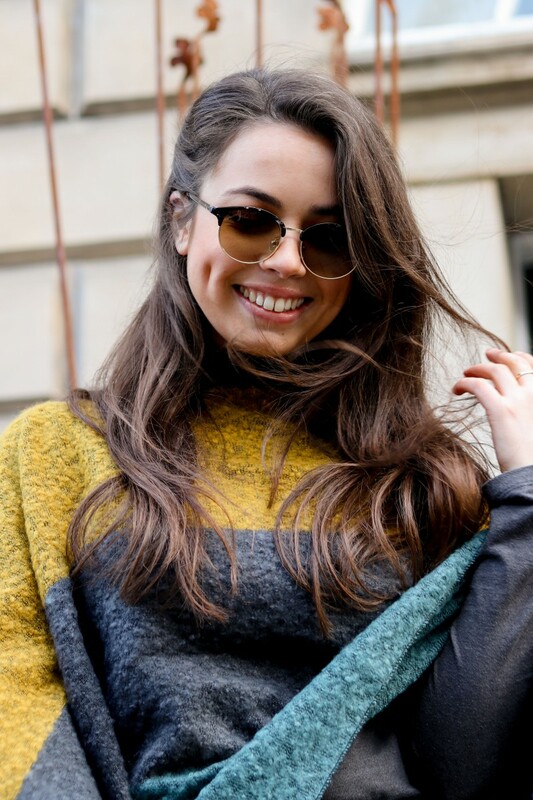 Working as a Freelance Blogger and Stylist, Annabelle is the perfect person to know for all things aesthetically pleasing; her natural ability to pair shapes, colours and designs made her the idea candidate for becoming one of our fun and fashionable Brand Ambassadors! Why not take a look at her everyday styling abilities on her personal Instagram today!